Tell Fstoppers: Will You Buy a Canon or Nikon Professional Mirrorless Camera? We are on the precipice of another major shift in the photography industry, as Canon and Nikon prepare to unleash professional-level full frame mirrorless cameras. Are you going to buy one, or is it too little, too late? Can Canon and Nikon Catch Up to Sony? If we're talking about professional users, I think that's a bit of a red herring. Canon and Nikon are the established titans of the industry, and Sony is the company seeking to usurp them (and they're progressing quite well at that). As such, the question should be: "Can Canon and Nikon create sufficiently feature-rich cameras to prevent their users from jumping ship?" A supplementary question should be: "Can they leverage their existing lens lineups?" If we indulge the question of Canon and Nikon "catching up" to Sony, I think they have a steep hill to climb. Sony has the a7R III, a camera that can shoot high-resolution stills at sports frame rates natively (the D850 needs a grip to even come close to the a7R III's native speed). They have the a7 III, an "entry-level" camera that's anything but that we loved in our review. Both offer full-frame, oversampled 4K video. 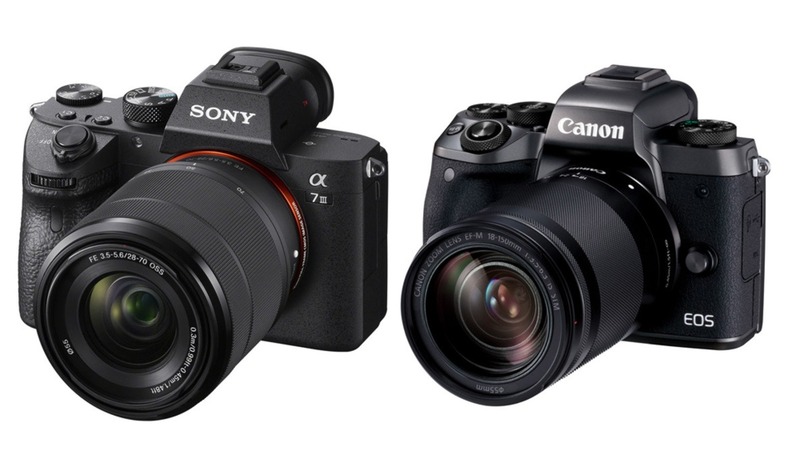 Both are aggressively priced, with the a7 III in particular leaping well ahead of other cameras in the same price range. Do I think Canon and Nikon can build mirrorless cameras with similar feature sets? Yes, of course. Do I think they'll do it at similar price points? Not so sure about that. Look at the 6D Mark II, after all. It is possible they will out of pressure from Sony, though. After all, one of the companies admitted one of the main reasons they're even getting serious about mirrorless is because of Sony. Back to what I think are the more relevant questions. Can Canon and Nikon create sufficiently feature-rich cameras to prevent their users from jumping ship? Well, inertia is a powerful thing. When you're a pro deeply invested in a lens ecosystem, switching is a pain, both in terms of work and finances. If you own 10 lenses, you might make do with a lesser body to avoid exchanging all that glass. Yes, for those in the Canon camp, you can achieve a reasonable compromise using lens adapters in certain genres, but if you're a demanding pro, you really need to get a set of native glass. This lens issue works in Canon's and Nikon's favor in two ways. First, because they have a large contingent of pros deeply invested in their glass, and for many of them, switching is infeasible for either financial or convenience reasons, but there's a catch (more on that later). Second, because they've been around longer, they simply have larger lens libraries, particularly in the more niche and extreme realms that certain pros often venture into, such as supertelephotos. Nonetheless, the Sony 400mm f/2.8 is on its way, and you can bet they've got more in the works. The point where a photographer will decide the value of switching exceeds the hassle is different for each individual, but anecdotally speaking, I see a lot of my friends starting to reach their individual points. Then there's the second question: Can they leverage their existing lens lineups? Well, yes and maybe. "Yes" in the sense that they have deep lens libraries that are appealing to almost any type of photographer. As mentioned, however, Sony is catching up, while brands like Sigma are helping to fill in the gaps, and Fuji has a great library themselves if you're comfortable with a crop sensor. "Maybe" in the sense that it comes down to how they handle the lens mount. The problem for both companies is the flange distance, the distance from the lens' mounting point to the sensor plane. It's much shorter on mirrorless cameras since there's no need for a mirror. All signs seem to be pointing to Nikon introducing a new mount, while the Canon side is a bit murkier, though I would also predict a new mount with some sort of EF adapter. If the two companies introduce autofocus adapters, it's not the end of the world for their shooters (possibly). Whereas a third-party adapter has the issue of dealing with another company's AF algorithms, it's possible a Canon-made adapter will handle EF lenses much better than the Metabones just by virtue of keeping it all in house, perhaps well enough to obviate the issue. The same goes for Nikon. Still, that's not as elegant a solution, but sometimes, physics forces you to be inelegant. 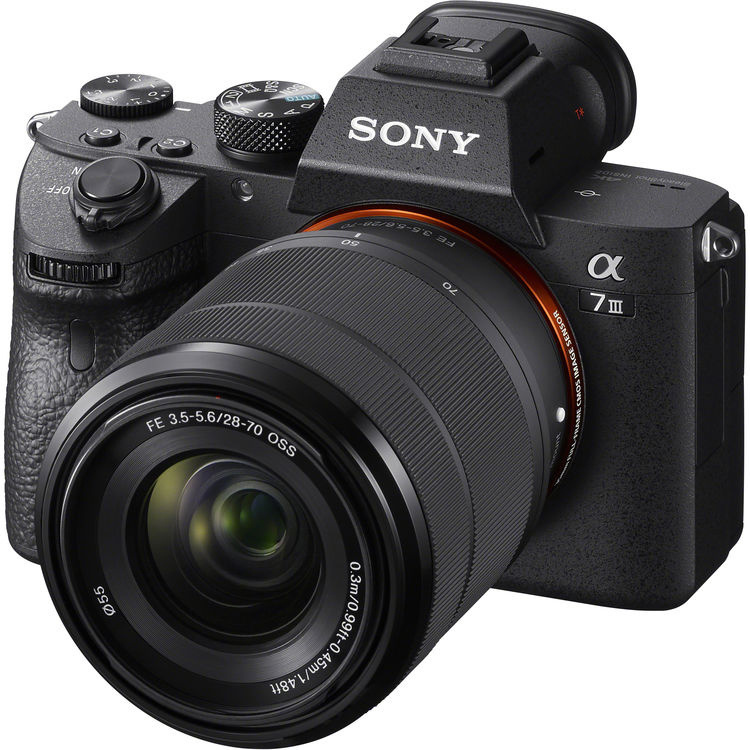 Still, a lot of genres demand the fastest AF speed and highest accuracy at the pro level, and if the adapter is even 10-20 percent below native performance, that lens library advantage may evaporate, and suddenly, Sony will be the most established full-frame mirrorless lens manufacturer. Even so, if they do introduce new mounts, they'll still bring out new lenses for that mount in addition to the adapters. Those will cost them money to develop and manufacture, and they'll fragment their ecosystems. I'm not saying they'll abandon their EF and F mounts; that would be insane. But continuing to develop, produce, and support two separate full-frame lines will be a tricky balancing act, and it will muddy the waters for photographers wondering what to buy, thereby decreasing the advantage. 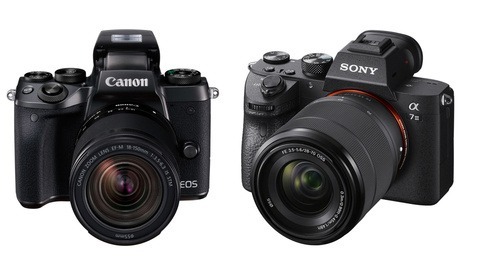 Does it matter if Canon or Nikon catch up to Sony? I still think it's a question of balancing photographer inertia with feature sets. Sony has some remarkably sophisticated features that I don't see Canon or Nikon implementing at a similarly well-developed level in a first iteration (if they're there at all). For photographers looking to make an initial investment in a mirrorless full-frame system, I think Sony will hold the advantage. And if they can hold the feature set lead over time and continue to add to their lens library, they'll continue to lure other photographers and continue to increase their market share. If nothing else, the release of Canon and Nikon full-frame mirrorless cameras is good for photographers because of the competition it will generate within the industry. 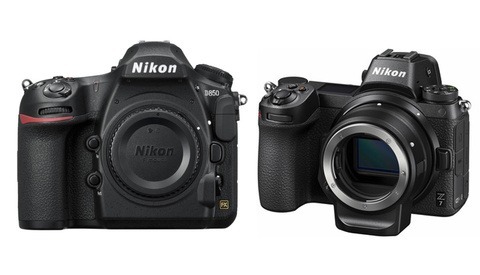 Are you invested in the Canon or Nikon systems? What are your plans when their mirrorless cameras appear? What will it take? Vote below and let us know in the comments. Can't vote because I'm not a Canon/Nikon owner. Discrimination at its finest. (sarcasm here if that wasn't obvious). I'm holding out till Photokina to see who brings what to the table before making a decision on my next camera. I'm definitely going to need a camera in a few months -- my K5 is showing its age. FF or Crop, change systems or stick with Pentax? Decisions, decisions. I loved the K-1 when I reviewed it aside from the autofocus. If you like Pentax and don’t need the advanced AF, it’s a good one. I'm a little torn. I'd love to be able to use my current lens lineup, and save a little money that way (yes I'm aware of the crop limitations, but it'd work in the short term). But the k1 is a pretty heavy camera compared to Canon's FF, and I want to get back into hiking. The k5 has similar AF limitations, it drives me bonkers to continually miss focus when photographing critters. I was disappointed to read it hadn't really improved in the k1. Another reason I've been hesitant is I was (note the past tense) pretty sure that Pentax is quietly shopping around for a buyer, rather than investing in R&D, and as a result was reluctant to keep investing in that line. We usually get leaks and rumors about new flagship models by now. But they recently released a new lens which is sounding really nice on paper. I"m not as certain now, needless to say. All this to say: right now I'm keeping an open mind. Personally I'd never go crop sensor. But that's me. If I can round up the extra cash this fall (money is a little tight atm) I want to rent a FF first so that I can get some hands-on experience in the field before buying. I like my K-01, too bad they put in a crappy AF system in it, otherwise we may see more hybrid camera that is mirrorless but use the DSLR mount lens. Canon will likely never want to cannibalize their Cinema line so at least video feature wise, I don't think their cameras will match the video tech that Sony gives you with their A7 series. I mean, how long did it take Canon to give users 4K in a DSLR body, and even once they did the implementation was poor. Due to the aforementioned reason above though, I ditched Canon years ago to go to a mix of Sony and Panasonic and never looked back. I knew Canon no longer had any intention to give me the video features I wanted at that price point. I am not sure to make the switch to full frame soon. But definitely, I am interested in mirrorless camera. If Nikon releases a DX mirrorless camera, I’ll probably get it (depending on price and specs). If they release a full frame... well, I’ll wait to get more full frame lenses, and I’ll get their next full frame mirrorless camera in 5 years. Your poll doesn't cover enough options: I'm already a Canon mirrorless owner (M5) and use it almost everywhere, but hate it and any EVF systems for studio use. That has everything to do with white balance issues and EVF's. So, I'm going to stay with DSLR's for studio use and for some other situations, like long exposure night photography but will use the mirrorless for most other out-and-about scenarios. You're posing this as an either-or scenario, but these are just tools and may have different use case scenarios, so owning both makes sense for a lot of people. You may or may not realize that Sony allows the ability to turn the live view simulation off, which allows the evf gain to adjust way up for studio situations, allowing to better see in the dark, better than any dslr by comparison. I use this feature all the time. It's fantastic. Otherwise, you're probably already shooting in manual with set parameters anyway so all that is no different than with a DSLR. Check into it, it's a great feature on the Sony's, has been for years. Thanks! I just realized that I can get one of my custom mode buttons to remember this setting, which I already have set to basic studio settings anyway, so that helps. It lowers the annoyance factor by a ton! Sony's platform, especially the 7rIII is best suited for studio use. USB-C for fast tethered transfers of even uncompressed raws. Most studio work isn't using available light so even with an optical viewfinder, you will not see your intended image. Set the viewfinder to use available light, and you have a better low light experience than any DSLR. I was very skeptical until I actually started using the platform. It's raised the bar, and having no mirror has allowed for the implementations. Ergonomics are going to be a huge factor for me. As long as the mirrorless Canon bodies handle very similarly to their DSLRs then I'm game as I'm long due for an upgrade (currently rocking a 5D and 5D Mark II). My dream camera would honestly just be a 5D Mark IV without the mirror box. This is my sense as well. If Canon stays with the in hand feel of its pro lines (5Dxx/1Dxx) then I might consider it. However, my gut tells me that Canon and Nikon will shrink the body down to compete with Sony's small bodies. If that's the case, then it's DSLR for me. Nikon and Canon do already have a good start at least... Canon has reasonably decent live view use, not as good as Sony though, but still they have DP AF which is great... I actually would expect the to release a 5D4 body with no mirror so all EF lenses work the same as they do on current bodies. This keeps the Canon sensor and ergonomics in play without changing much at all other than adding an evf in place of the prism. Nikon had fantastic AF with the 1 series... It was just that those were 1in sensors and could not compete in a pro world. I tried just about every model and really enjoyed them. Just small sensor so not the same IQ. I also loved the DF when I had it, may still get another some day, and the D750, D500 ergonomics were just about perfect. So if Nikon offers something similar, just mirrorless, that allows use of my vintage glass, I'd buy in a heartbeat. Very curious to see what Nikon comes up with since they also tend to lean towards sticking to stills more than other manufacturers. So far mirrorless just hasn't been an "oh wow" experience for me. I shoot a lot of mirrorless consumer devices, so I tend to appreciate the OVF when I get the chance to use it. I'm far too invested in Nikon mount glass to switch to Sony. I've thought about it for years, but I just can't. If Nikon can make a huge move into the mirrorless market I will def. switch if said mirrorless body is better than the D850. I already switched to Sony from Canon which I would *never* have believed possible. I loved my 5dMkiii. But the a7iii was what I had wanted the 5dMkIV to be. In fact, it had the features that I expected Canon would know their users wanted. But Canon likes to play father figure, telling us about features we don’t need. And they have their rich pals who can just buy one of their C300’s and use it like a home movie cam. Canon doesn’t care about the consumer market anymore, which is a disappointment. But it’s not a crime. I just wish they would be more open about that, if it’s a strategy. Sony is embracing hybrid photogs like me; I need stills *and* video, in one camera. I need Log, and decent 4K video. The a7iii was a no-brainer. Yes, I had to get some new glass. But the body, 70-200 f2.4, and a Samsung 35 came in at less than what I think Canon’s next prosumer camera will cost anyway. Would I switch back to Canon if they had the right features? Maybe. But they’re going to have to innovate like mofos to catch up. The next few years will be exciting. If Canon decides to compete. Happy with my Panasonic G9..so none of them. I am sure they will be great cameras from both stables. That all said I have on interest in moving to mirror-less or switching out my Canon 5D Mark II's I have now. They are doing all I need. Will see what is around in 3-4 years time after all the dust has settled. Doesn't apply to Canon either, it is physical imposible, unless they decide to keep all that empty space where the mirror used to be. Heck no I’m not buying mirrorless, I’ve got to much money invested in dslr stuff. I wish I could have the D850. What does that have to do with upgrading your camera body? Everything should work the same if not better with just a lens adapter. If that’s true, what you write, then yes, of course I would upgrade. But if there is any loss of light reception, via the adapter, then no I would not upgrade. My fastest excellent lenses are only f2.8. You shouldn't have any problem with loss of quality. The adaptors pretty much only make up for the distance of the sensor to the lens, since there is no longer extra space need for the mirror. It not changing the optics like a teleconverter or something. 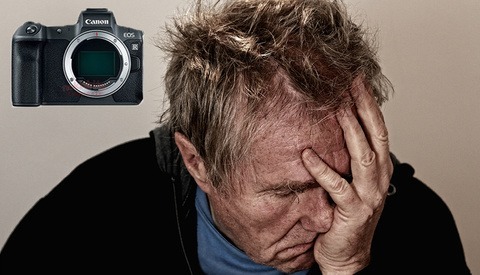 The only problems you could have is compatibility between manufactures (canon lens on sony body) do to the electronics. But if you're putting canon on canon for example, everything should work smooth. There are pros and cons to both DSLR's and mirrorless. I just bought a A7III and love it so far. I will still continue to use my 5DII until it dies.